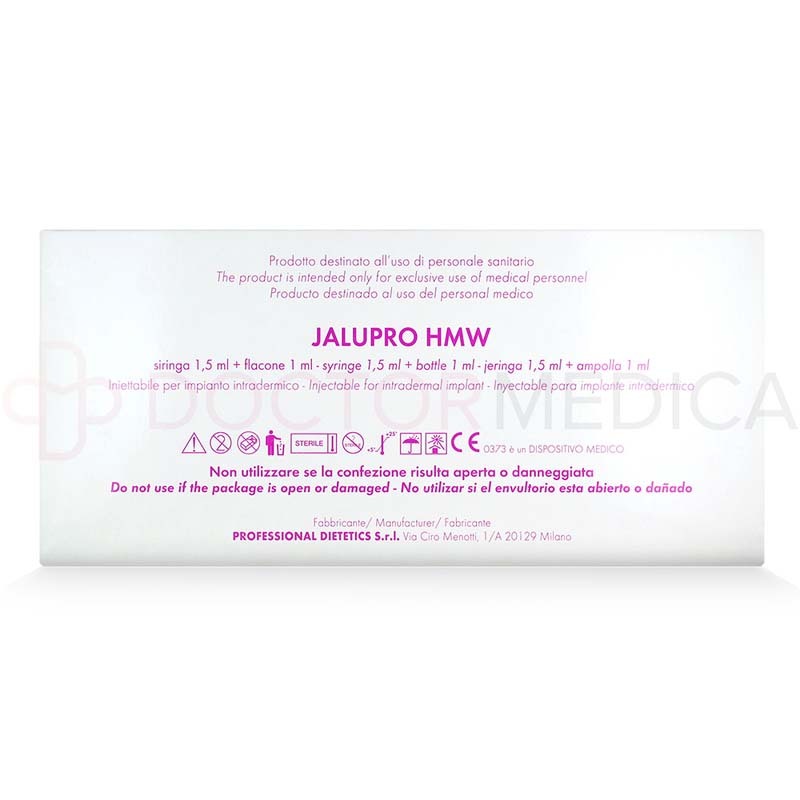 Where can I buy Jalupro HMW? 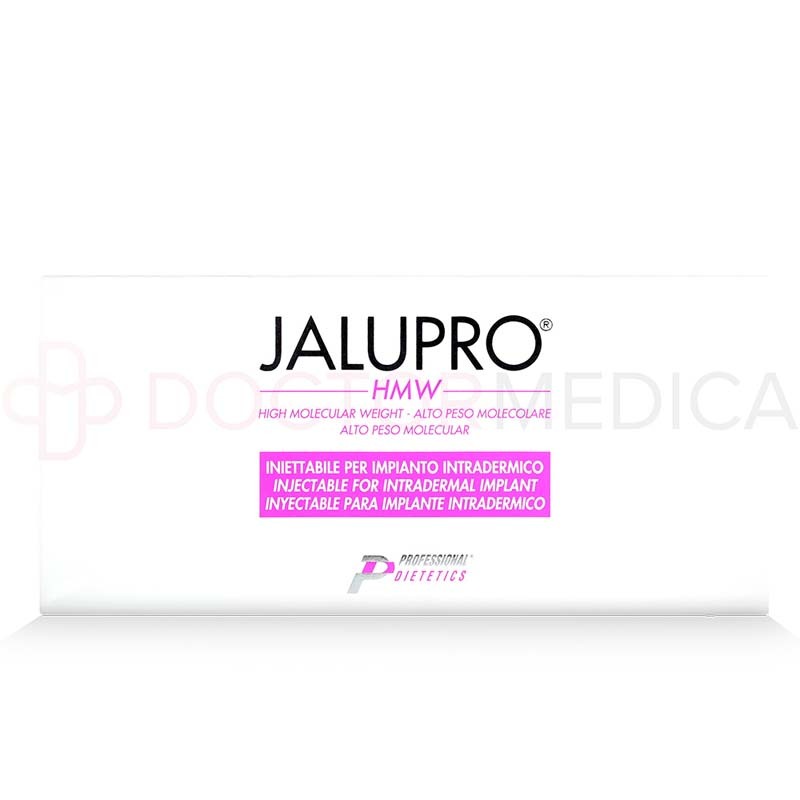 You can buy Jalupro HMW from us, a dermal filler that revitalizes depressions in the skin caused by wrinkles or scars, giving a smooth, plump and supple look and feel to skin. You can order this filler online from our website 24 hours a day and 7 days a week by registering your account. Doctors and all licensed medical practitioners can shop with with us. You can also order via phone, fax, or email at our affordable prices. Every order you make you will also benefit from our convenient free shipping offers with low minimum purchase quantities. What does the package come with? Included in the Jalupro HMW packaging box is a single disposable glass syringe containing pyrogen, which is a sterile gel of sodium hyaluronate. Also in the box is a single glass bottle of sterile solution of amino acids base. There are no needles included in the package. What are the benefits of Jalupro HMW? Jalupro HMW is technically termed a dermal biorevitalizer. It is a resorbable injectable dermal filler that treats skin defects, especially depressions in the skin caused by wrinkles and scars. This cosmetic filler provides biorevitalization benefits; in other words, it helps to restore the normal metabolic processes of the cells in the skin and improves their bioactivity. This product will repair, smooth out, and plump up the skin, especially in the areas where skin is marked with ruts, depressions, or deep wrinkles. The natural nutrients contained in the solution also rehydrate and moisturize the skin, which helps refresh and brighten aging skin. The HMW in Jalupro HMW stands for “high molecular weight.” The sterile dermal filler solution is made of a combination substance known as sodium hyaluronate, which is the salt of hyaluronic acid, and a group of the amino acids that includes glycine, L-proline, L-leucine as well as L-lysine HCL. The sodium hyaluronate contained in the dermal filler is similar to the naturally-occurring hyaluronic acid found in bodily tissues, which is responsible for giving skin its natural volume by providing support within the layers of the skin. On the other hand, the amino acids found in the solution are responsible for stimulating the natural growth of collagen and encouraging the formation of new skin cells. These natural substances provide thickness, elasticity, and suppleness to skin that is thin, wrinkled, dehydrated, or has the appearance of deep furrows. How does Jalupro HMW work? Fibroblasts are cells in skin tissue that produce collagen and help to repair skin. This natural metabolic process, however, can be interrupted by factors such as aging, sun damage, extreme physical activity, diet, or alcohol consumption and smoking. When fibroblasts are unable to produce enough collagen to compensate for the damage caused by any of these factors, the skin begins to exhibit this lack of adequate collagen in the form of loss of natural elasticity and volume, bad skin tone, dullness, and wrinkles and furrows. The hyaluronic acid and amino acids contained in the dermal solution provide the skin with the necessary natural nutrients to revitalize the skin, restoring its volume and moisture, reducing wrinkles, and giving the skin a bright, radiant tone. How do I use Jalupro HMW? 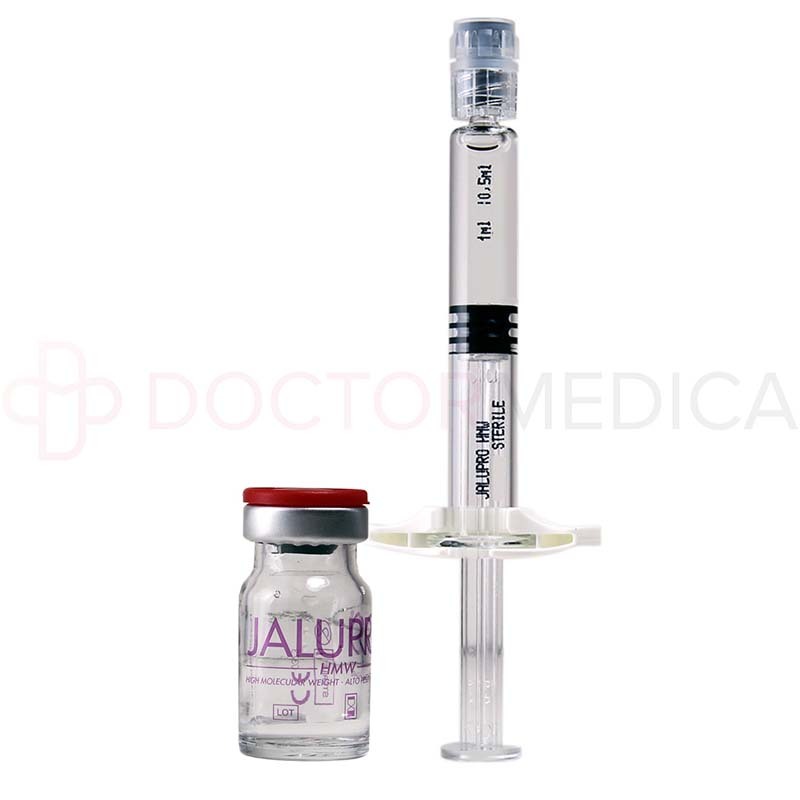 Jalupro HMW comes in two separate vials containing the two sterile components of the filler; that is, the hyaluronic acid solution, and the amino acids solution. These components should be mixed together to form a single injectable solution. If requested by your patient, you may add a local anesthetic such as procaine. You may use the linear, grid shaped, fan shaped, micropapules, or mixed injection techniques to apply the dermal filler solution into the patient’s skin. You should insert the needle down the wrinkle line and gradually retract the needle while releasing the solution. Once you have injected the solution, if necessary, you may gently massage the treated area to ensure the proper distribution. To treat thin wrinkles, it is typically recommended that you inject into the reticular dermis. How long will treatment take with? Treatment sessions with Jalupro HMW are very easy and quick, with a single session taking only up to an hour at the most to complete. The cosmetic filler injection should be repeated every 6 months to ensure that the skin retains the hydration, moisture, smoothness, and plumpness that this dermal filler provides. This injectable cosmetic filler also requires very little downtime, with patients taking only a few days to make a full recovery. 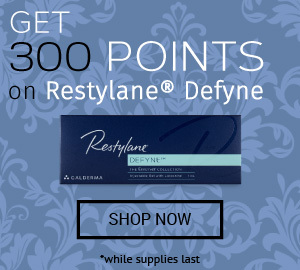 What can this dermal filler be used for? Jalupro HMW injectable dermal filler can be used not only to revitalize skin that shows early and advanced signs of aging, including shallow and deep wrinkles, furrows, depressions, and dehydration, but also to improve dullness of the skin or poor skin tone. Additionally, this dermal filler can be used to reduce the appearance of stretch marks, and is also ideal for use before or after surgery. What areas should I use Jalupro HMW on? You can use this dermal filler to correct and repair skin defects and depressions not only on the face, but on the neck, underarms, décolletage, abdomen, inner thighs, and the knee area. You can also use the filler to reduce the appearance of shallow and deep wrinkles, scars, and creases. This injectable solution also rehydrates and moisturizes dry skin, repairs sun damaged skin and improves the results of various cosmetic procedures. Results from treatment with the solution can last for an average of 6 months. You should recommend that your patients schedule a follow up procedure every 6 months to maintain the beautiful results attained from treatment with Jalupro HMW. Why should I use Jalupro HMW? 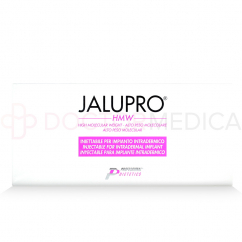 Order Jalupro HMW wholesale at the best price on offer by visiting DoctorMedica.co online or contact us via phone, fax, or email. Give your patients the results they desire using this natural biorevitalizer that will leave their skin with a natural, youthful radiance. Our worldwide shipping offers are customized to suit the needs and requirements of your specific location. At Doctormedica, we exclusively offer genuine dermal filler solutions to ensure the best possible results, so you can trust that Jalupro HMW will satisfy your customer’s needs.. Please refer to our How to Order and FAQ pages on our website to get more info. Who is Jalupro HMW intended for? This sophisticated combination of hyaluronic acid and amino acids is ideal for those patients who show early or advanced signs of aging, including medium to deep wrinkles, or who experience poor skin tone, and skin that is dehydrated or dull. Besides reversing these early and advanced signs of aging, this solution also works for patients who wish to correct stretch marks, scars, and creases. Because hyaluronic acid is a natural substance that is already present in the bodily tissues, allergy tests are unnecessary prior to administering this dermal filler. Some of the most common side effects of Jalupro HMW injections may include some minor swelling, redness, and bruising. These reactions typically fade within a few days.